As you know, I am an avid outliner. And that is an understatement. However, most of the writers I know do what you are doing – start without an outline and then write one later in order to organize what has already been written and assess what still needs to be done. My hat’s off to anyone who can write a whole novel without ever doing an outline. I have no idea how they do it. Oh, I know you belong to the outliners gang, miss 30,000 word outline person. No my hat’s off to you. My whiteboard has cork on one side, to which I attach index cards with scenes. That way I can move them around. 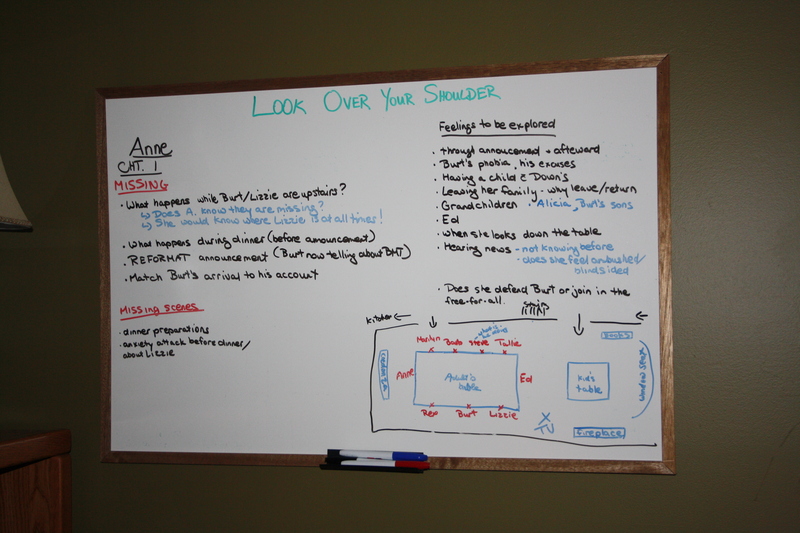 I put the whiteboard on an easel so I can flip from written ideas to index card scenes whenever I want. Although I sometimes just end up with cards all over the rug. Wow, that’s a great idea. Maybe I should get a cork board as well. I have cork board all around my desk, but it’s full of notes, affirmations and junk. Exactly the way I work. I always start with such a rush of enthusiasm, then gradually lose steam. Then I outline as I go along, one or two chapters at a time. Often find I don’t follow the mini outlines, or go beyond them, but they keep me on track. Glad to hear I’m not as weird as I thought – well, I’m probably still weird, just not so weird about outlines. I’m with you on this, Sharon. The novel I’m working on popped up in bubbles. Not the cute ethereal bubbles that come with a bubble wand, but the slow, blurpy ones that rise in stew–or swamps. At a certain point, I needed way to connect the dots–er, bubbles. That’s when I mapped out a way to get “home.” Doesn’t mean bubbles don’t still blop right beside me, sending me a little off-course (in interesting directions, of course.) Just means the novel’s GPS recalibrates the course when the scene’s done. Fantastic advice, Heather. I will definitely check it out.